This entry was posted in #Blog on August 29, 2012 by Stanford. MightyText is by far one of my favorite services/apps. This service allows me to send and receive texts on my PC. The functionality comes in great when I want to stay at my full PC keyboard, rather than physically picking up my cellphone. The service installs an App on your smartphone(Android for now) . Then you install an app in the browser(Chrome, Firefox, IE and Safari), and boom ! Your set ! I have used this for tech support and archival purposes. Yes I now have a way of keeping my old text messages ! This entry was posted in #Blog on August 25, 2012 by Stanford. Upcoming Workshop. 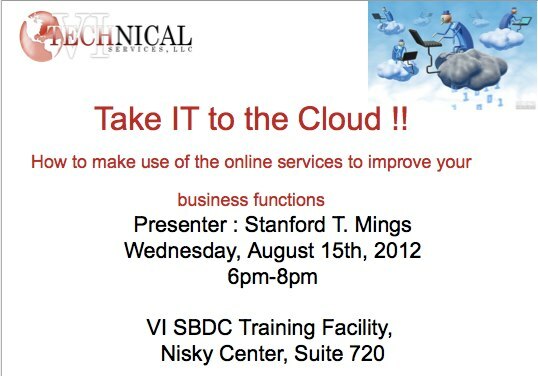 Be sure to sign up and learn about the Cloud !! This entry was posted in #Blog on August 14, 2012 by Stanford. Great article from PC Adviser in the UK, that speaks to me as I view myself as a “Technology Swiss Army Knife”. The nation’s employment outlook for IT professionals has suddenly surged, gaining 18,200 jobs, the largest monthly increase since 2008, according to tech employment-research firm Foote Partners. In July, 4,900 new IT jobs were added in two job segments, telecommunications, and separately “data processing, hosting and related services,” Foote Partners said today. Also added were 13,300 other jobs in sectors called “management and technical consulting services” and “computer systems design/related services.” The firm says these last two categories, with a combined total of 242,000 jobs added in the past 24 months, have seen solid growth even in the midst of the nation’s general economic malaise. This entry was posted in #Blog on August 9, 2012 by Stanford. Today marks another milestone in my life as a Technologist. I was asked at the last minute to testify in the Virgin Islands Superior Court on an Internet matter involving domain ownership. I was sworn in and qualified as Expert witness in Information Technology and Web Technologies. It’s official ! I am an Expert in the eyes of the Law !!! I was assured that I did a good job and now can put that under my belt. Guys wear a blazer or a suite. That place is has the AC set to high. After about 30 minutes my fingers began to tingle. Do not ramble on. Answer the question and only the question. I know us techies like to elaborate, but don’t ! Imagine you are doing one line logic tests. If asked X then respond Y. No elseif. No grouped responses. The court physical layout are not like TV (e.g Court Judy or Matlock). In fact it was quite efficient in it’s design and function. A lot of curves and smart use of space. Let’s see what doors this opens. This entry was posted in #Blog on August 6, 2012 by Stanford.